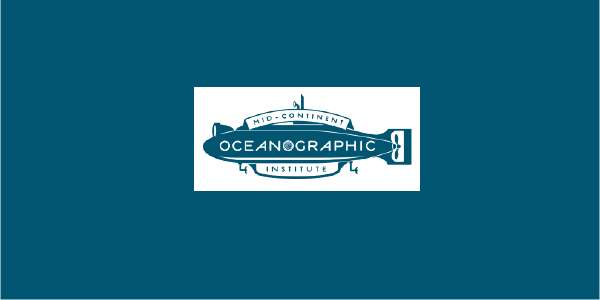 Mid-Continent Oceanographic Institute, or MOI, provides support to underserved K-12 students through creative writing instruction as well as after-school and in-school tutoring and homework help. Find ways to attract and engage more high school students to the services and programs provided through MOI. Users for this project included high school students, their parents, high school educators, MOI staff and volunteers, and finally, donors to MOI. Work with MOI began with a presentation by the executive director of the organization. 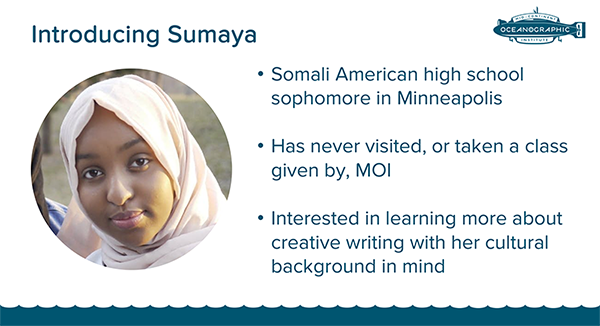 This presentation covered the various challenges faced by MOI which included branding-related issues with English language learners, the relocation of the organization to Minneapolis, and difficulties in attracting and engaging high school students to the services and programs that the organization provides. The challenge of attracting and engaging high school students was selected as the focus for this particular project. An exploration of literature and research was undertaken to examine the cultural and sociological impact of an organization like MOI. Also, throughout the project, research was conducted to gather information about how poetry impacts young people. Finally, research focused on related organizations and businesses that provide tutoring and homework help to K-12 students. Two personas were also developed representing a high school student and a non-profit partner organization employee. 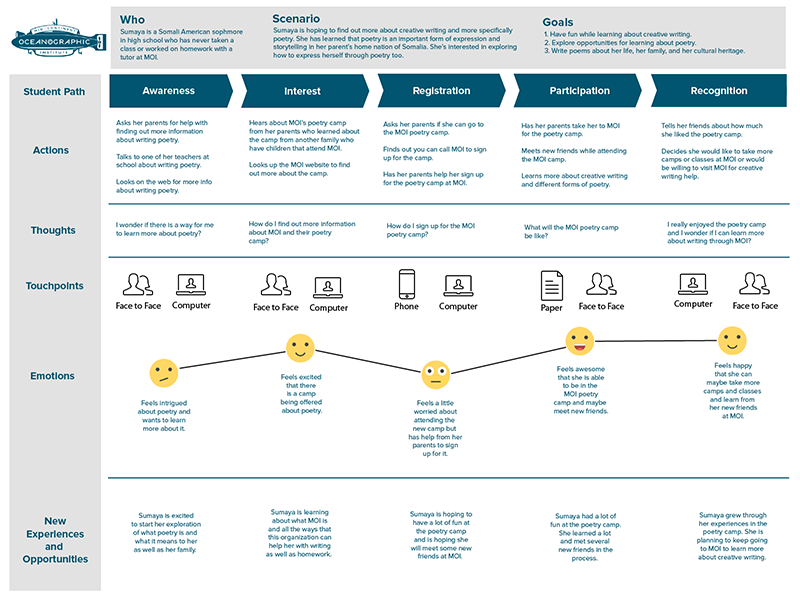 A journey map was created outlining a user journey for the high school student persona for this project. This path shows the progression of the high school student taking a poetry class provided through MOI. Along with the actions, thoughts, and emotions, you can see new experiences and opportunities for this student provided through the poetry class. Two wireframes were developed as possible future website pages for MOI. The first wireframe consisted of a web page highlighting partnership opportunities. It covers why other organizations and businesses might partner with MOI and what the MOI organization has to offer in return. This page could be used immediately on the MOI website to provide a place to point other organizations to and encourage them to get in touch with MOI. For the second wireframe, a design was created to showcase a possible web page for a poetry workshop for high school students. The page highlights dates, times, and other general information about the workshop as well as provides details about a poetry slam event after the workshop that friends and family of the students can attend. The purpose of the content created for this wireframe was to highlight an event dedicated to high school age students and encourage them to participate in an MOI program. This initial participation might encourage them to continue to use the services and attend more programs through MOI.